remains concealed/suppressed/subverted by the Court, favouring the Credit Industry, in this and many cases that followed. The Court of Appeal has refused to report material and determinative evidence of Statute-Protected 'Consumer Credit Agreements' that feature in this case (aka "Regulated Agreements" - as defined by S8 (2) & (3) Consumer Credit Act (1974) ["The CCA"]) in the knowledge that the unreported evidence reveals serious regulatory abuse at Natwest, contrary to the terms of both its Consumer Credit and Banking licences. The CCA was intended by a unanimous Parliament to address the very behaviours employed by Natwest in this immediate case; the Non-Documentation of Regulated Agreements where variations or modifications by verbal agreement occur during term and especially where a modification to an existing regulated agreement is made by way of a (supposedly) perfected charge (ie in writing) that was taken by the bank against the family home to secure the agreed borrowings, affecting both present and past regulated agreements. Regulated Agreements of the type that feature here, but which the Court withholds/conceals/suppresses/refuses to report, are required to be written to be legally enforeable. In the course of the many years before this case got to Court, we uncovered serious "flaws" within the bank's lending procedures that revealed a policy of not documenting as required by Law. The bank's standing instructions to its branches regarding the procedures to be followed to comply with the CCA were inadequate, meaning in real terms that individual branches were left very much on their own. The OFT (Office of Fair Trading opined (in conjunction with the Bank of England opined that the bank faced possible regulatory investigation, where the Bank of England and OFT were concerned that the evidence would show vast non-compliance with the CCA's 1983 Documentation provisions - the OFT in particular, advising that, subject to the ruling of the Court, it considerd that the agreements were regulated agreements. However, where the matter was subject to this immediate test case, they were powerless to Act without the ruling of the Court, which itself raises many questions, where the Courts plainly withhold and continue to withhold a material regulation that applies to the facts. Only a detailed investigation of the facts will determine why the Court has refused to give way to the regulated agreements that undoubtedly feature here; Notably, Natwest dressed up what in reality was a CCA claim as a common law claim, in violation of the Jurisdiction provisions within Section 141 of the 1974 CCA, which forbids the High Court to hear any such CCA matters. You guessed it, the High Court accepted the case and acted without Jurisdiction as was made plain during Closing Submissions when a red faced leading barrister admitted to the High Court that the regulation applied to the very first agreement that featured on the facts. Regretably, the High Court Judge did Not then transfer proceedings to the County Court as required under Section 141 and also failed to report the honourable admission by the bank's silk, Mr Andrew Smith QC. Proceeding to Judgment, the Judge found that the CCA did Not apply to the facts, and we are currently challenging that decision on the basis that he did NOT have Jurisdiction to hear the case; that the Judgment is Void for the lack of subject-matter Juridiction. The CCA's draftsman, Mr Francis Bennion, has spoken out against the rulings of both the High Court and the Court of Appeal, saying that the Judgment of Auld LJ on the Appeal reveals "an uncertain judicial grasp" - but he is refused admission by the Court and goes unheard (link to his critique below). At The earlier High Court hearing, HHJ Raymond Jack had accepted an admission by Andrew Smith QC, for the bank, that the CCA applied to the case - however his honourable admission was NOT reported by Jack (J), and so far, both Andrew Smith and Raymond Jack have failed to confirm that admission; where in reality it reveals the "vexatious and frivolous" possibly contumacious nature of the bank's case in bringing a common law claim where its own senior Counsel was aware that the CCA applied - to forbid the enforcement the bank plainly required. The bank had thus placed the Courts in an invidious position, knowing that many many billions of Pounds across the UK hung on the Judge's decision, where unsecured regulated agreements are refinanced by an unwritten agreement that is secured against the family home. Countless thousands of families have suffered as a result. Needless to say, in this immediate case, the bank was diligent where it ensured the security was properly written and perfected - BUT, crucially, NOT the agreement(s) behind the taking of the security. In reality, it is a very sad day for British Justice - the Judges show their frailty toward Parliament's intervention in moneylending Law, (Parliament decreed that consumer credit agreements Shall be in writing, to combat the widespread abuse of the banks where they step outside of the Law. Judges are forbidden, (where they often show disdain for Parliament), within the terms of the Judicial Oath to subrogate any Acts of Parliament to their own law, ("The Common Law"), yet, here, they are seen to do just that - and it is done in order for The Judges and NOT Parliament to maintain 'Control' of this important area of Law, raising many Questions of great Import as to their real Objectives and to their 'Allegiances', where many within the ranks of big business are themselves barristers of note, often QC's ("Queen's Counsel"). including, at the time of this dispute, Natwest's own Chairman, Robert Alexander QC (later, Lord Alexander of Weedon), whom it must be said, was a man of the highest repute. It is widely held that the Judges will favour the banks, when push comes to shove, (possibly because of their associations with the leaders of the banking fraternity), - but here we prove it, (and the Judges know it), to the legal burden of "Beyond Reasonable Doubt" -ie; 100% - the Criminal Standard, whereas the burden of proof in Civil cases (such as this) is (supposed to be) determined on, " the Balance of Probabilities" ie; 51%. Our Applications to the Court of Appeal to Reopen the case (based upon the concealed evidence and the unheard evidence of Mr Bennion) are currently being ignored by the Court without Comment. There is not a single barrister in the land who will step forward to bring the case to the Supreme Court - possibly because two of the Judges who decided this case, Lord Woolf and Lord Robert Walker sit or have sat in that Court. When asked at Appeal for permission to Appeal to the (then) House Of Lords, Lord Woolf (then Master of the Rolls) said, "We shan't concern their Lordships with this. Permission Refused." My own silk, Jonathan Gilman QC said that "an appeak to the House of Lords would amount to a review of the workings of (The CCA), possibly at considerable expense to the public purse". Legal Aid Costs had already exceeded £1.5 millions by this stage (this sum did NOT include Natwest's costs)- The Court declines to give the actual figure. So, You May Well Ask ----- "What The Hell's Going On ?" placing the banks in an extremely precarious position - yet, at the end of the day, thousands have (instead) lost their family homes after the (incomplete) ruling in this immediate case where it is followed in all similar fact cases. GET IT IN WRITING !!! We at ruinedbynatwest.com are indebted to our colonial cousins at Yahoo! 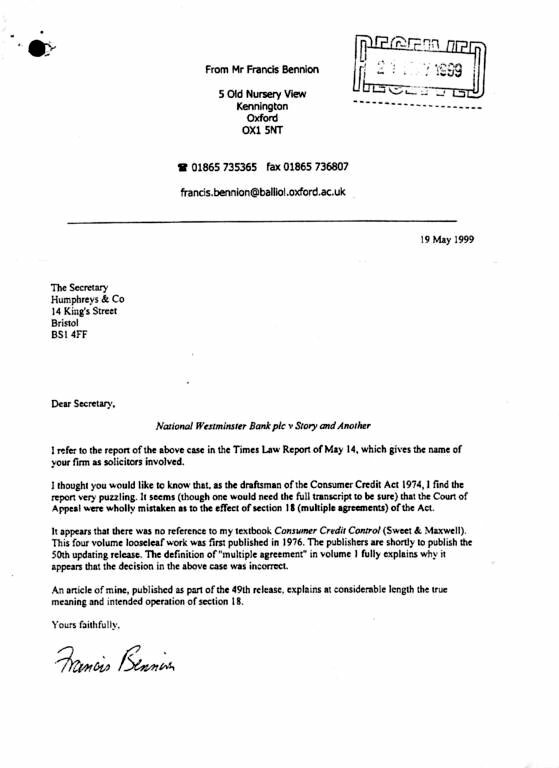 for upholding the right to free speech in the bloody aftermath of a hotly contraversial and topical consumer credit test case from 1999 that affects consumer credit refinancing transactions of an everyday nature across the UK to the tune of at least 300 Billions' GBP (2004 CAB figure). We seek only that the case be properly reopened to ascertain the authority of Parliament where Parliament intervened in the Law to properly uphold consumer's rights to written terms in Consumer Credit Agreements where Parliament determined as LAW that Unwritten Consumer Credit Agreements (aka Regulated Agreements) of the kind that feature, but which go unreported here, are irrecoverable at Law, in the situation, as here, where the Lender fails to document the contractual terms of a refinancing agreement that affects the security of the Consumer's family home. "an enactment for the protection of debtors"
a case with which the Courts closed the door on ALL future challenges that similarly feature improperly executed "Multiple Agreements", as here.The Courts do not mention our continuing challenge where we apply to reopen the 3 existing regulated agreements that remain undisclosed in Story on the grounds that the Court does not have Jurisdiction to suppress the CCA in this way. (Section 127(3) 1974 CCA prohibits any Court from issuing an enforcement order where essential terms of regulated agreements are unwritten) a provision that addresses the tendency for banks to not document terms - think about it - the costs here exceeded 1 Million pounds GB. How many consumers can now find such sums to challenge a bank ? Mr Jackson had promised us £500,000 of bank funding, (Property Development), IF we followed his forthright and unambiguous business advice - he failed to document his promises and misled the Court whilst under oath. The first defendant (Story) was warned, forthrightlyand unambiguously, by his own leading counsel, Mr Peter Smith QC, on 1st May 1997, a week before trial at first instance, (Bristol High Court) on 1 May 1997, that "the Judge willFudge" and that "Truth and Justice will be early casualties in this case", because the outcome would otherwise be "potentially disastrous for Natwest". He prodded Story in the chest as he made his points, adding, "No Judge in this country will allow you to avoid your obligations using a technical defence". He then took steps to see that Story's Legal Aid Certificate was discontinued, refusing to run the CCA defence. The certificate was reinstated, but for junior counsel only, just before the trial started; the eventual costs far exceeded 1 million pounds. The Court refuses to confirm the actual figures which we believe to be nearer 1.5 millions. to Local Weights and Measures (Trading Standards) departments at first instance, on the paperwork (or the lack of it). Copyright 2009 ruinedbynatwest. All rights reserved.